To what extent do you agree with each of the following? • I am more strict than most people about what is right and wrong. • I prefer simple and unprocessed foods. • Making money is the main reason for hard work. • I feel that life is like a lottery. These statements come from a survey by Karl Dake (1991). 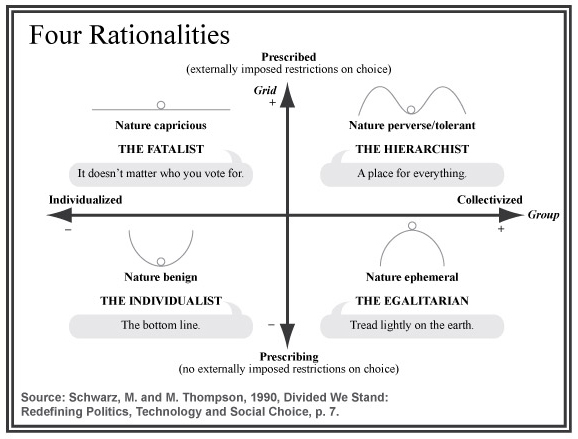 Responses were used to measure alignment with particular worldviews, as depicted in the typology of “four rationalities,” above. According to Dake’s analysis, being more strict than others would indicate a tendency toward a hierarchist rationality; preferring simple and unprocessed foods signals an egalitarian rationality; money making as a primary motivation describes the individualist; and a life-as-lottery view belongs to the fatalist. Similar categories are familiar from a wide range of social-psychological literature: Max Weber’s types of rationality; Jane Jacobs on the commercial and guardian syndromes; Amitai Etzioni and others on communitarian thinking; Alan Page Fiske on authority ranking, market pricing, equality matching, and communal sharing; and so on. The matrix pictured here, adapted from Michiel Schwarz and Michael Thompson (1990), is one presentation of a typology of worldviews called cultural theory. It plots acceptance of social controls (on the vertical axis) and levels of social commitment (on the horizontal axis). In the quadrants, the worldviews or rationalities depicted are alternatively described as archetypes, ways of life, social solidarities, and myths or caricatures of nature. I first came across cultural theory in the Resilience Alliance compendium, Panarchy (see: “Not Wrong, Just Incomplete”). In fact, Schwarz and Thompson credit RA founder Buzz Holling’s “myths of nature” as a primary source of inspiration. The hierarchist’s story (nature perverse/tolerant): International protocols and national commitments are needed to address the tragedy of the atmospheric commons and reduce greenhouse gas emissions. The egalitarian’s story (nature ephemeral): The underlying problem is consumption (resource throughput). Precaution, lifestyle simplicity and grass roots action are the most effective responses. The individualist’s story (nature benign): To address climate change, rely on laissez-faire markets to spur competition and innovation. The benefits of climate change may even balance out the costs. The fatalist’s story (nature capricious): Natural forces are beyond human understanding, much less human influence. A fifth worldview, called “nature resilient” (Thompson, Ellis & Wildavsky 1990) or “nature evolving” (Holling, Gunderson & Ludwig 2002) is sometimes pictured at the central intersection of the axes, overlapping each of the others – we might say, in the language of psychologist Ken Wilber, transcending and including each of the others. Holling, Gunderson & Ludwig characterize the nature evolving worldview as flexible and adaptive. Holders of this worldview actively experiment with new institutions, seeking to gain insights. Diversity, modularity, redundancy, feedback are key principles of institutional design (see resilience thinking). Karl Dake. 1991. Orienting dispositions in the perception of risk: An analysis of contemporary worldviews and cultural biases. Mary Douglas. 2006(?). A History of Grid and Group Cultural Theory (pdf). C. S. Holling, Lance Gunderson & Donald Ludwig. 2002. In Quest of a Theory of Adaptive Change. In Panarchy: Understanding Transformations in Human and Natural Systems. Michiel Schwarz and Michael Thompson. 1990. Divided We Stand: Redefining Politics, Technology and Social Choice. Michael Thompson and Marco Verwell. 2004. The Case for Clumsiness (pdf). Michael Thompson, Richard Ellis & Aaron Wildavsky. 1990. Cultural Theory. To follow this line of research, see the Cultural Cognition Project, especially Dan Kahan’s blog.